OK, let's give this a try. I'm pretty rusty, but I think I remember how to do it. Welcome to Season 22. We're wearing our fru fru finery. We've had our cheese and merlot and CAKE. And I'm ready to tell you all about the Dancing. I think I am. Here we go! Kim Fields and Sasha Farber dance Cha Cha Cha. Kim says best case for week one is that she "don't hurt nuthin". I remember Ms Fields from Facts of Life. Lady got groove. Plus she's an actor so she's all about the performance. She and Sasha have great chemistry together. The choreography was basic, but there was plenty of content for the first week. Kim handled what she was given very well. She has great musicality and timing. She does need a little more hip action, but she danced with great energy. She'll have to work on her footwork and relax her shoulders to get her hips moving. I enjoyed the performance, and that's as much about her dancing as it is about the fact that she's Tootie! Judges say 7,6,7 for a total of 20. Paige VanZant and Mark Ballas dance Foxtrot. She's an MMC fighter and it may be impolitic to say it, but it will be interesting to see how she transfers her athletic power into elegance and grace. Oh, no problem there. I don't watch fighting so I really had no idea who she was or how she was going to react. She was outstanding. She had plenty of elegance and grace, and beyond that she had presentation and confidence. She's a lady gang. That shouldn't surprise me, and I apologize that it does. I shouldn't stereotype her because she fights. I really enjoyed that performance. She had musicality and her lines were really nice. She extended through the movements. There is so much potential there. I thought she was very confident, and Mark is going to have a great time teaching her. Judges say 7s across for a total of 21. Doug Flutie and Karina Smirnoff dance Foxtrot. OK. Equal impolitic comment...let's see if Doug can translate his athletic power into elegance and grace. It's a plus that he gets to start with a ballroom style in the first week. He has very little rhythm and almost no musicality or timing. But that's OK. He embraced the opportunity and gave it his all. He lost his balance a bit through the twirls and that messed with his steps, but other than that he got it all in and made it through the dance. Dancing certainly isn't natural to him, and some of his movement is awkward. He smiled throughout the performance and Karina gave him good choreography that he could handle. Judges say 5s across for a total of 15. That's OK. I suspect he'll have a fan base that should get votes and potentially he could improve. Jodie Sweetin and Keo Motsepe dance Tango. Her biggest problem may be getting out of her own head and not putting too much pressure on herself to do well. She does have some dance background, and talk about a built in fan base. I figure she'll not only be an early favorite because of her dancing, but she'll have the Full House crowd poised to vote. Oh good for Keo. He has a partner this season and he can really stretch with his choreography and performance to really make her look good. That was really strong, just as I suspected it might be. There definitely are some areas to work on, like posture and head position and control. They were just a little exuberant, which made the dance seem hectic in spots, although I did like the attitude and attack. I think these two could settle in quite nicely. Judges say 7,6,7 for a total of 20. Hmmmm...I would have expected 7s across for that performance. Geraldo Rivera and Edyta Sliwinska dance Cha Cha Cha. This could be awkward. And it was. Although he his 72 years old. And he does have a sense of humor about himself, opening the dance with a reference to Al Capone's vault. But let's face it, there was no real dancing in that routine. He just doesn't have any natural rhythm. He tried and he had fun, which might be the best thing I can say. There just isn't much else. It's kind of a rotten thing to do to Edyta on her first season back after taking so much time away from the show, but someone had to get the guy who can't dance a lick. Fortunately we'll get to see plenty of Edyta during the pro routines with the dance troupe. And yes, pun was intended because we always get to see plenty of Edyta. She is Queen of Tiny Costumes! Judges say 5,4,4 for a total of 13. Ouch. Marla Maples and Tony Dovolani dance Quickstep. Tough dance to begin the competition. I think Tony just might have himself a pretty good partner for this season. She has lovely long lines and a very playful presentation. There was a moment where it looked like Tony was dragging her across the floor, but she managed to hang on and keep her feet under her. I thought she kept her poise. Her posture was pretty good. Did I happen to mention that she has lovely long LEGSSES? I didn't? Well she doesss, preciousss, yes she doesss. I love Tony's choreography and I can tell that he enjoys her. She was elegant even as she lost frame and timing a couple of times. Very solid performance. Judges say 7s across for a total of 21. Wanya Morris and Lindsay Arnold dance Cha Cha Cha. Love it. Boys II Men was actually my introduction to hip hop music. I like that Lindsay made her choreography around Wanya's personality. And man did he dance it. There could have been a little more Cha Cha Cha content and a little less hip hop, but the energy in the room red lined. There's no question he has musicality and excellent timing. Plus he's got swag. I think he brings a lot of what Alphonso brought a couple of season ago. Wanya will have a huge fan base that should pick up the phone, and he'll deserve those votes. The man has natural rhythm and takes choreography really well. It will be interesting to see how he controls that swag and turns it into the elegance and grace needed for the ballroom styles. I'm thinking he'll do just fine. Judges say 8,7,8 for a total of 23. Wow. Ginger Zee and Val Chmerkovskiy dance Jive. Now that was fun. I like that Val recognizes what he can give his partner each week, and he knew that she could handle just a little more difficulty in his choreography. He won't hold back on degree of difficulty once he recognizes potential. She managed most of it, but there were just a couple of times when she wasn't confident with her steps. Other than that, she had so much chemistry with the audience. We could see how much fun she was having. She threw herself into the dance and brought the rest of us in with her. I think one thing she'll get better at is extending through each movement with her legs and her arms. That's going to come with confidence and I don't think it will take her very long to build that confidence. I loved that performance. Judges say 8,7,8 for a total of 23. Wow again. Mischa Barton and Artem Chigyintsev dance Tango. Sometimes the celebrities think they know what they are getting into, but realize pretty quickly once rehearsals start that it's way more than they expected. Sometimes they rise to the challenge, and other times they just don't have what it takes. I think Mischa is one of those who will ultimately thrive if she stays in the competition long enough. Her performance was very reserved, and I think that comes from lack of confidence. She's going to have to work on her posture because she's really leaned over. It was almost like her upper body wasn't connected to her hips and legs. She was certainly awkward and I don't think she has a natural rhythm or musicality. I think she has the potential to get there, but she'll have to commit to it and bring more energy to her performance. And trust Artem. Judges say 5,5,6 for a total of 16. Could have been worse. Nyle DiMarco and Peta Murgatroyd dance Cha Cha Cha. I had no idea he was deaf. It doesn't matter. Perhaps someone can tell me how a person who can't hear anything at all can have natural rhythm, musicality, and timing. Wow. I absolutely loved that performance. Peta's choreography was outstanding, and Nyle followed it the whole way. He never missed a step. He was on time throughout. He does have some things to work on such as footwork and extensions through his arms and hands and fingers. But I have to say that even for a celebrity who can hear, that was an outstanding performance. He danced with energy and so much personality. He and Peta have a wonderful chemistry together. Judges say 8,7,8 for a total of 23. 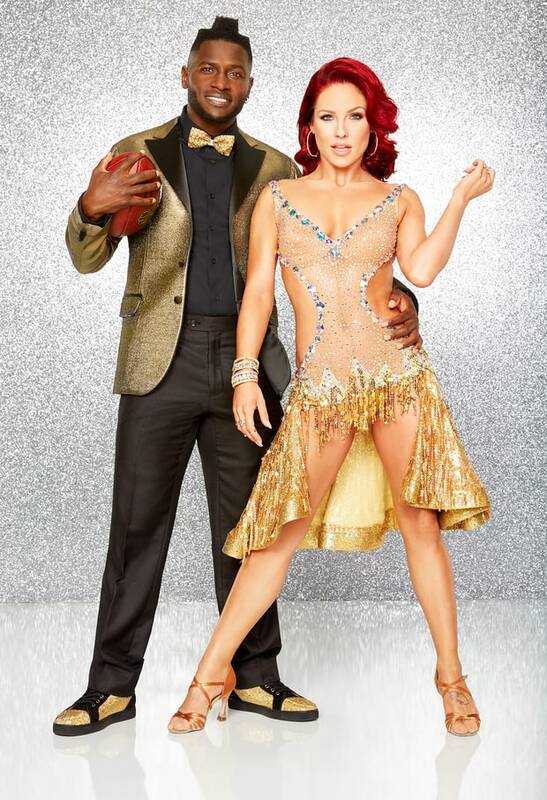 Antonio Brown and Sharna Burgess dance Quickstep. Oh you just know Antonio wanted a Latin dance to start. But he'll have to demonstrate elegance, grace, and control right off the line. I liked his musicality and his energy. You could tell he was having a great time with the dance. I thought he did a fine job on some of the quick footwork, although for the most part I didn't think he danced as cleanly as he should. He has the same issue that so many football players have...keeping his upper body from leaning forward and controlling a tendency to be a little hectic. Football is about attack, but dance is about knowing when to pull back and find the moments between the phrases. Quickstep isn't an easy dance to start with, but he did a credible job. I love his personality. Judges say 8,6,7 for a total of 21. The 8 is too high, so the 6 balances that out. Von Miller and Witney Carson dance Foxtrot. Congrats to Witney on her recent marriage! Now with Von, I think starting with a ballroom style actually was good for him. I actually expected him to be light on his feet. He's a big man, but as linebacker he has great footwork. I though he did a good job keeping his shoulders back and down, which couldn't have been easy because Witney is so small compared to him. A natural tendency would have been to lean down toward her. So that's an early point in his favor if he doesn't have to break a habit to lean. I thought he had a wonderful ease in his movement. I think he has tremendous presence, and it was great to see him show control throughout the dance. I'm very happy with this performance. Judges say 8,6,7 for a total of 21. The 8 was high again, but again the 6 balanced it out. I dig this cast gang. There's a lot of personality, a lot of energy, and a lot of potential. Hey, that was kind of fun. Reading back through for my edits, I can definitely tell I'm rusty. I'll have to work it out and get back into review and recap shape. Tune in next week for a Latin night and our first elimination. Geraldo actually looked like he has a bad set of knees or unsuccessful knee replacements. There was just nothing there to critique. Like you, I was very surprised by Paige VanZant. I think think she is a contender. Looking forward to this season and your reviews.